Over the past few days the Dollar – Yen pair (USDJPY) has taken a trip below its 200 Day Simple Moving Average, which is always something to take notice of. It even looked for a while there that it was entering what could have been a new downtrend. However, the move below the 200 DMA always lacked conviction. We can see the pinbars indicating that this move down was rejected by the market on no less than three occasions on a daily basis (small blue arrows). There is another pin bar in evidence, pointing in the downward direction, but this is a special case as it was formed on the day of the Non-farm Payrolls report for April, which was on May 2nd. There is very often total indecision and high volatility on NFP day. Yesterday, the first trading day of the month, was a good one for this pair. 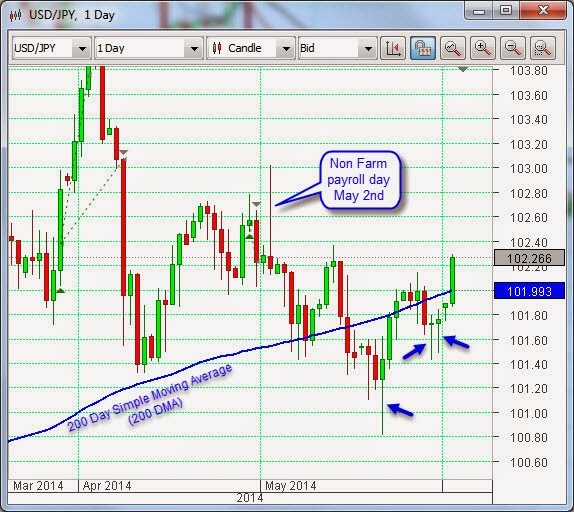 It now remains to be seen if this increase in the value of the Dollar – Yen will be sustained. Will it break out of the narrow range it has been in for an extended period? The Reserve Bank of Australia (RBA) announced its interest rate decision early this morning (GMT). As was widely expected, there was no change in the rate. The accompanying statement basically reiterated what was the status quo since the last meeting: The Central Bank’s stance remains accommodative; a period of stability is now their main aim; the currency is higher in value than they would have expected or liked, particularly given the fall in commodity prices; recent apparent increases in private capital expenditure seem tentative; housing expansion is strong; jobs and wages could be better, and inflation is within target. They also gave it as their opinion that the markets were attaching a low probability to any rise in global interest rates over the period ahead. The Aussie dollar rose after the RBA announcement. This appears to be as a result of short covering, where market participants reverse sell orders they had put in place in anticipation of a fall in the value of the currency, which failed to come about. This has the same effect as if a number of new buyers entered the market, and drives up prices.